Sirsalis is a relatively young crater that lends its name to the longest straight rille on the Moon. It gives more than that too, for its ejecta covers the rille, and the even fresher Sirsalis F crater digs down into the rille and adds a little more debris. Sirsalis itself is a two-sided crater. On the rille side the wall has collapsed with slumps that are almost terraces. On the west the wall is a rim to floor scarp. Why the difference? 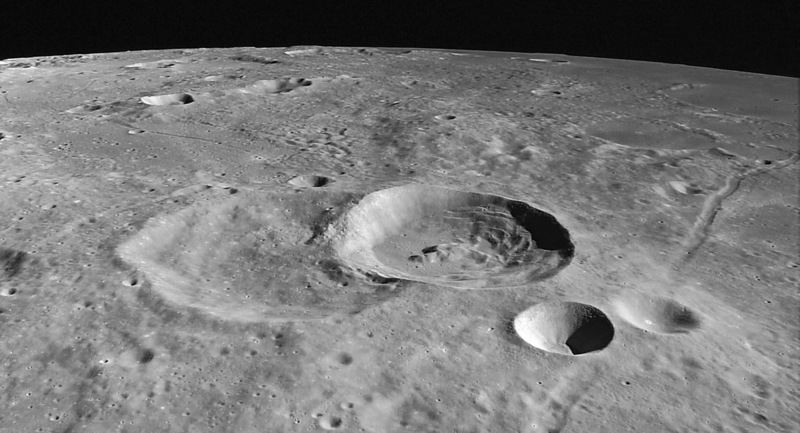 The crater is too old to preserve rays to tell if it formed as an oblique impact, which could account for the differences in rim morphology. But this looking to the limb view from Kaguya shows something not obvious in vertical images - the western rim is apparently lower than the opposite side. It may be lower because when it smashed into the pre-existing Sirsalis A there was a hole that the rim expanded into, rather than solid rock. Now the question is, does that have anything to do with the smooth rim of the west? I don't know - what do you think? This page was last modified on 13 October 2018, at 18:54.